Pawtucket, Rhode Island is a preppy kind of town in the 1970's, but it also has hippie counterculture that is immersed in drugs. 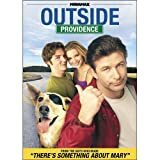 Tim Dunphy is a teenager in Pawtucket who has decided to fall on the wrong side of the law and has one too many run-ins with police for his father's liking. His father desperately wants his punk son to straighten out, so his father sends Tim to a prep school about as far away from trouble as Tim can get. Initially, Tim is not too enthused by the idea of having to change his life so drastically. But after a while, he realizes that going from punk to prep may not be such a bad thing after all.